Free Shipping Included! 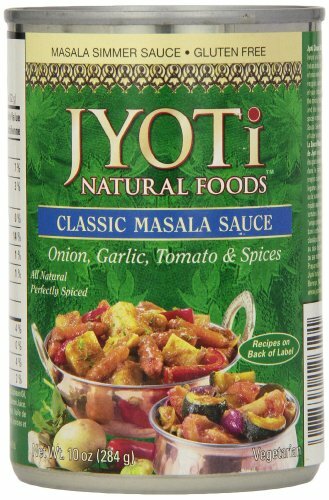 Jyoti Natural Foods Classic Masala, 10-Ounce Cans (Pack of 12) by Jyoti at Smokey Robinson Foods. Hurry! Limited time offer. Offer valid only while supplies last. Onion, Garlic, Tomato & Spices. All natural. Perfectly spiced. Vegetarian. Create Indian home style culinary delights like a pro! What's so special? Onion, Garlic, Tomato & Spices. All natural. Perfectly spiced. Vegetarian. Create Indian home style culinary delights like a pro! What's so special? Home style cooking, in small batches with fresh, natural ingredients using nutritional recipes that deliver authentic tastes and aromas. No preservatives, nothing artificial. Jyoti prepares a range of delicious Indian foods for today's life styles. Heat 'N Serve: Matar-Paneer (cheese and peas), Delhi saag (spinach/mustard greens), Punjabi chhole (spicy chickpeas), Jaipur Karhi (organic potato dumplings in spicy buttermilk), Madras Sambar (lentils and vegetables) and Dal Makhani (lentils and beans in a delicious sauce), which can be heated in the microwave, oven or stove top. Also, baby dark chickpeas (kala channa) - a versatile gourmet bean and a variety of delicious masala simmer sauces. Joyti classic masala sauce helps you create classic Indian dishes in the comfort of your own kitchens. Let the veggies, seafood or meat of your choice simmer with the onions, tomatoes, dinger and the unique blend of spices in this classic masala sauce. You'll be amazed at what you've created. Masala simmer sauce. Quick 'n easy cooking mix. Product of USA. If you have any questions about this product by Jyoti, contact us by completing and submitting the form below. If you are looking for a specif part number, please include it with your message.